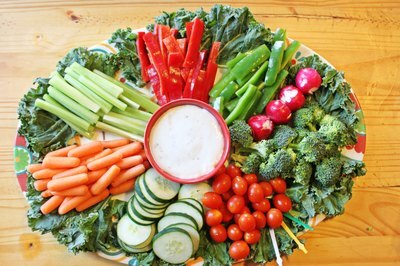 If you are hosting a party, you can't go wrong with a vegetable tray. 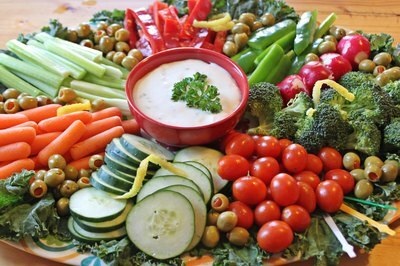 Trays filled with brightly colored vegetables and mouth-watering dip will please almost everyone. When preparing the tray, choose vegetables in an array of vibrant hues, textures and flavors for an interesting presentation. Use other food items as attractive garnishes. Cut the vegetables into presentable pieces in uniform sizes. Slice cucumbers and squash into rings, and make celery and peeled carrots sticks. Cut red and yellow peppers into strips. Carve red and white radishes into rosebud shapes. 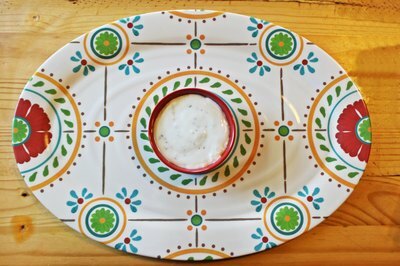 Place a bowl filled with vegetable dip in the center of the tray. Choose a traditional creamy ranch dip or healthy hummus. Additional dip options include french onion and salsa. Use a green pepper as a dip vessel as a creative touch. 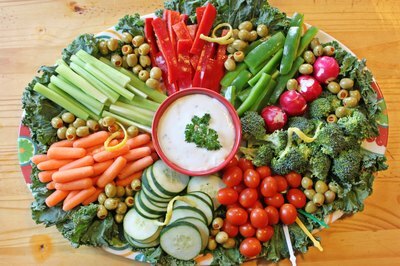 Arrange the vegetable tray in an eye-pleasing fashion around the dip bowl. First, line the tray with greens such as lettuce or kale leaves. Group each vegetable type together. 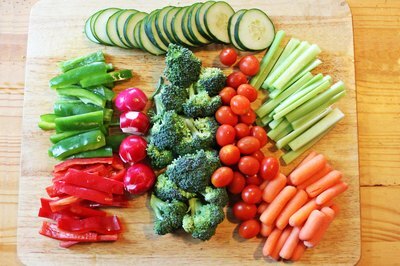 If you only have two types of vegetables, alternate the groupings around the platter. Spear cherry tomatoes with toothpicks or small metal picks for easy dipping. Provide metal tongs so guests can easily transfer the vegetables to their plates. Enhance the vegetable tray with accents. Use black and green olives to divide the vegetable groupings; place them in a line between the groups. Place a sprig of fresh parsley on top of the dip. Sprinkle a few bright yellow lemon peel twists on top of the completed vegetable presentation.